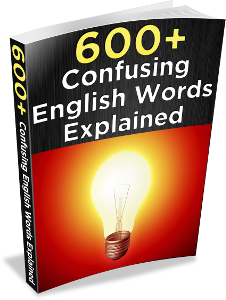 This is a free sample from the e-book 600+ Confusing English Words Explained. It will help clear up your doubts about how to use English words correctly, so that you can speak and write more confidently. Click here for more information! Win = To be #1 in a competition, or to receive an award. My soccer team won the game 3-1. I want to win the lottery! John won a prize in the science competition. You can win a game, a race, a match, a competition, or the lottery. You can also win a medal (like in the Olympics), a prize, or an award. Earn = To get something in exchange for your work, for example: a salary. Sarah is a famous lawyer; she earns a lot of money. I’m not rich, but I earn a decent salary. My bank account earns 2% interest per month. I’ve gained five pounds since I stopped exercising. Is she pregnant? It looks like she’s gained some weight. Jack’s car gained speed as he drove down the mountain.